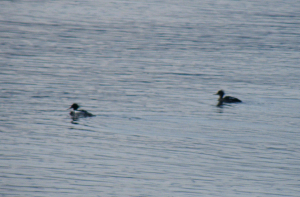 Observation - Pair of mergansers - UK and Ireland. Description: Photographs at the end of my range, but male and female just identifiable. Diving within about 25m of shore. Photographs at the end of my range, but male and female just identifiable. Diving within about 25m of shore.